Blend it all together for…a while. Run through a small mesh strainer OR a nut milk bag. The liquid is the milk- you can sweeten it if you like, add it to smoothies, and raw cacao powder to it. The “pulp” that’s left over can be used for “pates” or cookies, or dehydrated and ground into a meal or flour. Sprouts? What are they? Why sprout? What can you sprout? Basically sprouts are a seed, nut or grain in a certain stage of its growth period. And you decide to interrupt that stage….by chomping into it. Meanie. We sprout because it releases enzymes, nutrients, and vitamins. The little guys are high in protein too. Some of my favorite things to sprout are mung beans and lentils. These also happen to be two of the easiest. Go here for directions on how to sprout lentils. 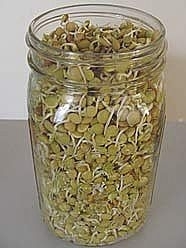 http://www.sproutpeople.com/seed/print/lentils.html super easy and the site has plenty of info on sprouting. It’s not really necessary to buy a bunch of gadgets for sprouting, a mason jar should do the trick. What to do with your sprouts? Well, depending on what you sprouted you might want to throw them on top of a salad, in a lettuce “wrap”, in a raw sandwich, in some raw soup, or whatever else you feel like! Another point to make while talking about sprouting is soaking. If you’re not sprouting your nuts and seeds, it’s best to at least soak them for 2 or more hours. This allows enzyme inhibitors (things keeping you from digesting that nut or seed easily) to be released from the nut. Just remember: “Soaking the nut is better for the gut.” <—- Ok that’s a ridiculous line. My sister also brought up the question: How do you eat sushi? It has rice on it so it’s not raw. Weeeell, as ridiculous as it may seem, if my only option is a sushi roll (maki)….I pick off the rice. Of course I could always just order sashimi. Bottom line is, I really don’t eat sushi that often, and when I do I order it with raw cucumber and avocado and remove all the rice. I actually removed the rice BEFORE eating a high raw food diet simply because it’s so starchy. What’s xylitol? Is it raw? Xylitol is the alien captain come from Zeebus to bring peace to all earthly beings. K not really. It is a sweetener sourced from fruit. It’s not raw, it has to go through a long and treacherous process to get to us at the health food store, in the sugar-free gum, and the “healthy” ice cream at the grocery store. It’s sweeter than sugar and contains sugar alcohols, so it doesn’t raise blood sugar levels as quickly. Other than that, it has no real nutritive value. It does have calories, but less than table sugar. It’s waaaaaaaaaaay sweeter than sugar. You can literally take a pieces of the leaf and start chewing it. 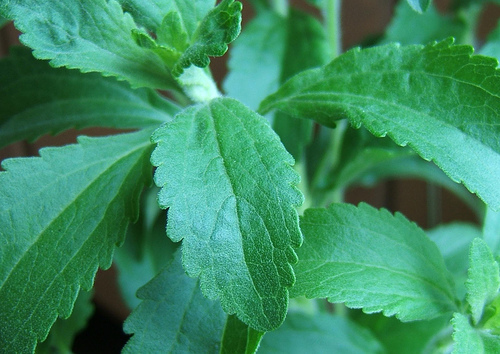 It’s very sweet….I know because I recently acquired a stevia plant and this is the first thing I did. Just to make sure it was true. : P So in it’s purest form you would take the stevia leaves and grind them up. I think once mine starts growing I will dehyrdate the leaves at a low temp and then grind them up into a powder. Yes this will mean there is a green tint to anything I make that’s sweet and uses stevia. Shrug. At the moment I’ve been using white stevia in small quantities. It’s not raw, but it only takes a very small amount to sweeten something. The best part is it’ s zero calories and zero impact on blood sugar. High five mister stevia, high five. And last but not least my sister asked about olive oil. Is it raw? Yes you CAN buy it raw, but it’s not easily available. Fats and oils are touchy subjects for some raw foodies. The point of a raw food diet, to me, is to incorporate as many healthy living foods into my diet as possible. Do I shutter from using a tablespoon of olive oil or coconut oil in a recipe? No. Should someone else avoid it? If they feel that’s best for them then of course! We each have to learn what works for us to be the healthiest and happiest.